If you haven’t heard of Ree Drummond, you’ve been missing out. Drummond has a hit blog, a memoir , a TV show, and a best-selling cookbook, Pioneer Woman Cooks . Drummond was a big city girl who fell head over heels with an Oklahoma rancher, married him, moved to the ranch and set about raising and homeschooling 4 kids in a remote middle America area. She’s not shy about sharing what a huge change this was for her and how hard it was to adjust to a rancher’s life – “I’m still adapting to life as a ranch wife,” she says in the book. If you’ve ever longed for the wide open spaces of ranch land in middle America, you’ll want to sit down with this book. 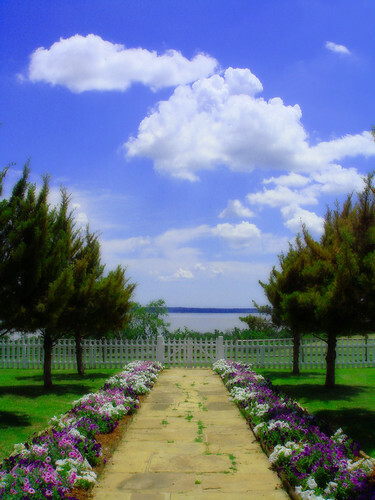 In addition to writing, blogging, and hosting a TV show, Drummond is also an excellent photographer and the book is packed with her photos – of her food (which is always shown in step-by-step photos to help you visualize the recipe), her home, the land, the horses and cows, her herd of kids, and of course, her husband whom she refers to as Marlboro Man (she even includes a tongue-in-cheek photo of his rear end in his jeans – of which she waxes poetic throughout the book – on the last page, titled “The End”). The photos are what make this book simply fantastic. Drummond shows us what is beautiful and breath-taking about her area, her family, and her ranch. Cowboy hats, long fences, tall grass, a creek at sunrise, spurs, cattle raised to be eaten and Drummond’s own cast iron pans bring it alive. It’s dusty and dirty, yet once you start paging through this, you’ll be longing for a pair of chaps of your very own, wishing you could ride the horses, rope the cows, and sit down to Drummond’s meals. Drummond has a knack for gritty, action-packed, storytelling pictures that bring you right into her life. If you ever wondered what life on a ranch is like, you’ll feel as if you’ve been there by the time you finish reading this book. This is a cookbook however, and I must confess to you that this book sat on my shelf for a long time before I cooked a thing from it. If you’re looking for gourmet fare, look elsewhere. But if you long for cowboy food, as well as some of Drummond’s own family favorites, dig in. Drummond’s offerings include Pico de Gallo, Cinnamon Rolls, Marmalade Muffins, Simple Perfect Chili, Cowboy Calzone, Chicken Spaghetti, and Olive Cheese Bread. These aren’t just recipes – Drummond has a story to tell with each one, so this is truly a cookbook you can sit down and read. Most of the recipes are things she makes to feed her husband, ranch hands, and children and are straightforward, hearty dishes. She includes one chapter called Cowgirl Dinner Party where she makes food she says her husband would not eat, but these end up being fairly hearty as well. I have often pulled this book out when I was looking for ideas of what to make and more often than not, it would help me remember one of my own recipes to make. When I decided to review it for this column, I decided I really had to cook from it! And I’m glad I did. 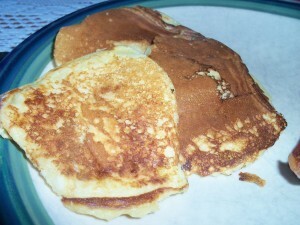 I tried Edna Mae’s Sour Cream Pancakes. I love sour cream. I use it in cookies, in cakes, in sauces, and just as a topping, but I never thought to try it in pancakes. I made up the batter and was a bit worried when there wasn’t much of it, but the recipe says it makes 12 pancakes. It does, but they are small and light, which I found to be a refreshing change actually. My family enjoyed these and they are a great alternative to heavier morning fare. Mix sour cream flour, sugar, baking powder and salt. Whisk eggs then add vanilla to them. Add egg mixture to the sour cream mixture, gently mixing until mostly combined (Drummond says some streaks of white or yellow are fine). Spray the skillet or melt butter in it over medium high heat and cook pancakes about 1 to 1 ¼ minutes on one side then flip and cook the other side for about 45 seconds (mine took a little longer to really brown up nicely). Serve with butter and syrup. Note from Vera Marie: If you have never used the “Print” button below this post, now’s the time. 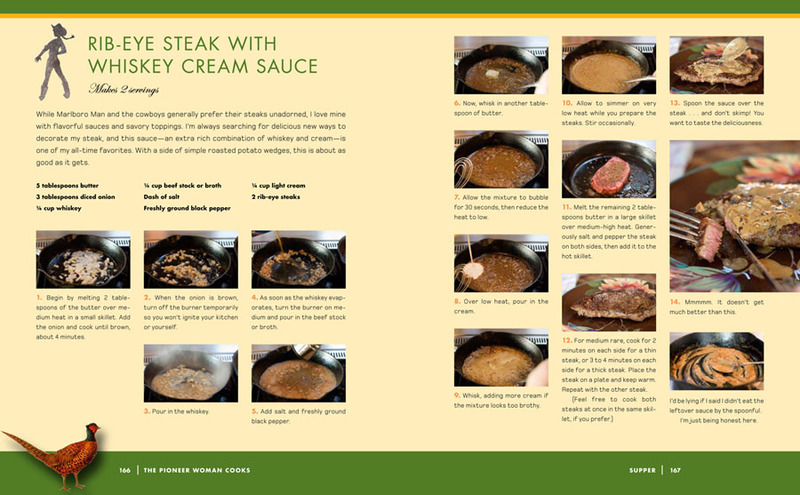 It is SO convenient for printing out a page, and when you want to get a recipe–it is perfect. The print button gives you a chance to print just what you want–in the case, the recipe, without any ads or anything else to distract. Do you sometimes buy cookbooks and just read them and put them on the shelf rather than cook from them, as Brette did with this one? I certainly do–particularly picture-filled books from Greece or Italy or France. Share your favorite “readable” cookbook that takes you away. My favorite ‘readable cookbook is “The Olive and Caper, Adventures in Greek Cooking” by Susanna Hoffman. The book is filled with contemporary Greek recipes, but Hoffman draws on her more than 30 years experience in Greece to fill the book with photos and stories and snippets of information, sayings and quotes. . .so many things that I often forget that I opened the book looking for an idea of something to cook. Good to get a perspective from someone outside the south on Drummond’s book, which I have enjoyed. agree with Breete’s thoughts on the photographs. to answer your question aboou readable cookbooks, another one I like is Country Cooking of Ireland, by Colman Andrews with terrific photographs by Christopher Hirsheimer. great essays about artisanal food and its creators too. good to get Brette’s perspective on Ree Drummond’s book from someone outisde the south and west. I’ve enjoyed the book and agree about the photographs. this looks delicious! we often make ricotta pancakes. i’ll have to get her book and read (and cook!). thanks, brette!